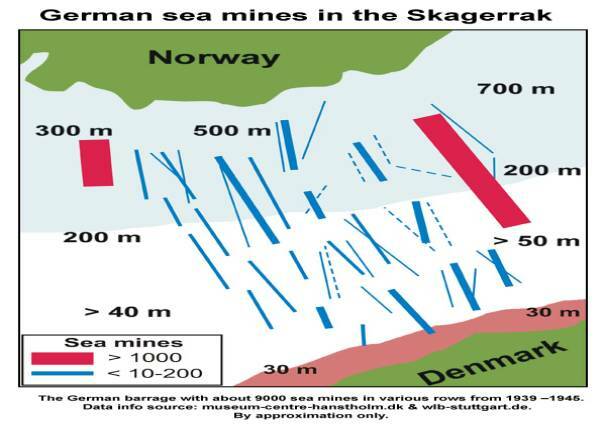 Sea mines in the Skagerrak – Did they effected the water body? COMMENT: Many thousand sea mines had been laid in the Skagerrak since WWII to prevent Allies naval vessels to enter the Baltic Sea. Many mines exploded prematurely immediately when placed, or during a storm , or on ship contact. They sea mine warfare could have had a large impact on the marine environment, with regard to the sea surface structure by mixing of different temperature and salinity layers. Only few months after the invasion of Denmark and Norway, the Skagerrak area experienced the coldest winter and lowest temperatures ever recorded. The reason did not came from nowhere, but had been close by. There are two types of sea mines, contact mines and remote sensor triggered mines. In the Baltic Sea and western sea areas around 165,000 mines were laid. Some were rendered harmless either manually or by natural causes during the war and the rest by minesweeping afterwards. Contact mines were swept whereby their anchor lines were cut allowing them to float to the surface where they were subsequently disarmed, detonated or sunk. A sunk mine was regarded as rendered harmless. Remote sensor detonated mines which were mainly used in the southwestern Baltic and Kattegat were much harder to clear as they are non-buoyant and at that time there was not the technology for locating seabed objects. These areas were kept closed until such time as the batteries could be assumed dead and therefore also the firing mechanisms. Around 15 - 30% (50,000) are reckoned to be still lying on the sea bed mainly in The Quark, the area between Skagen and the Swedish mainland and in the Sound with the largest concentrations in the Gulf of Finland and the Irbe strait.